Published: March 13, 2019 at 03:04 p.m. Updated: March 13, 2019 at 03:26 p.m.
General manager John Dorsey was hired by the Cleveland Browns on Dec. 7th, 2017. Dorsey has been busy in the captain chair with building the Browns with draft picks, making trades and hiring a new head coach, Freddie Kitchens. In the blockbuster trade for Odell Beckham, Dorsey reunites Beckham with close friend Jarvis Landry from their LSU days and gives Baker Mayfield another top playmaker to get the ball to. 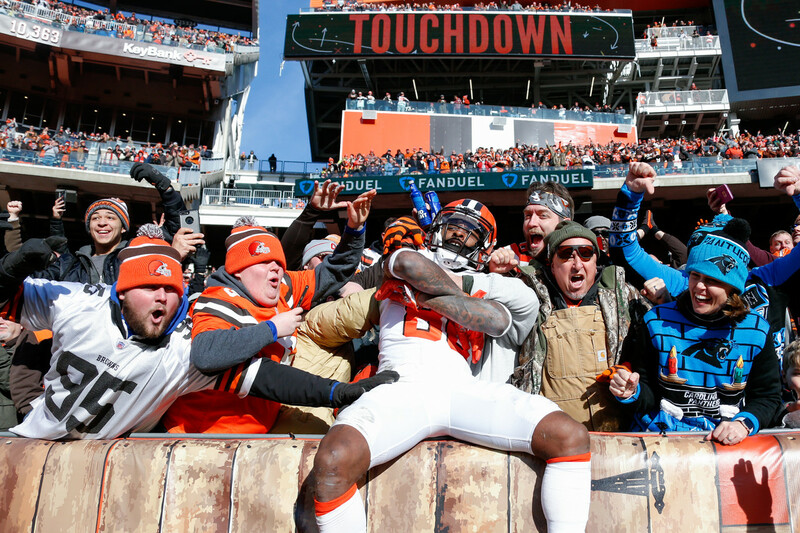 On March 15, 2018, the Browns traded for wide receiver Jarvis Landry from the Miami Dolphins in exchange for 2018 fourth- and seventh-round draft picks. Landry replaced Corey Coleman as a Browns starting wideout. On April 18: Jarvis Landry signed a five-year, $75.5 million contract extension. On April 26, 2018, John Dorsey's first pick as the Browns general manager was quarterback Baker Mayfield out of Oklahoma (1st overall). Baker was selected to the 2018 NFL All-Rookie Team after starting 13 games. Mayfield replaced Tyrod Taylor as the starting quarterback in the fourth game of the 2018 season. Before Dorsey was hired, the Browns' starting quarterback was DeShone Kizer. Mayfield signed on July 25, 2018 to a four-year, $32.68 million contract. On April 26, 2018, three picks after Mayfield, Dorsey selected cornerback Denzel Ward out of Ohio Sate (4th overall). Ward started 12 games and was named to the Pro Bowl and the 2018 NFL All-Rookie Team. Ward signed on July 25, 2018 to a four-year, $29.165 million contract. On April 27, 2018, Dorsey selected running back Nick Chubb (35th overall) out of Georgia in the second round. Chubb replaced Isaiah Crowell in the backfield and Chubb produced the 10th-most rushing yards in the NFL while averaging 5.2 yards per carry. In addition, Dorsey signed running back Kareem Hunt on Feb. 12, 2019 on a one-year contract to help in the backfield. On Jan. 14, 2019, the Browns promoted Freddie Kitchens to head coach after he served as interim offensive coordinator. On March 8, 2019, The Browns trade for defensive end Olivier Vernon from the New York Giants in exchange for offensive guard Kevin Zeitler. On March 12, 2019, the Browns agreed to terms with defensive tackle Sheldon Richardson on a three-year contract worth $36 million. On March 12, 2019, the Browns trade for Odell Beckham Jr. in exchange for a first-round pick (No. 17 overall), the second of the Browns' third-round picks (No. 95) and safety Jabrill Peppers. This is the second trade between the Browns and Giants in a week.